As part of a series of special events to mark Triskel’s 40th Anniversary, we are proud to present the great British Composer Gavin Bryars in Concert with the Ensemble in a programme that includes the first live performance in Ireland by the Ensemble of the seminal work “Jesus’ Blood Never Failed Me Yet”, and the Irish Premiere of “Winestead”, commissioned by Opera North for the Hull City of Culture in 2017 with funds from the PRS Foundation for Music, for which the T. C. Lewis Organ at Christchurch will be used, and which also features the voice of Tenor John Potter. The Programme will also feature recent and familiar works including the sublime “The Flower of Friendship”. The Gavin Bryars Ensemble are: Gavin Bryars (Organ, Double Bass); John Potter (Tenor); James Woodrow (electric guitar); Morgan Goff (viola); Nick Cooper (cello); and Aoife Burke (cello, “Jesus Blood Never Failed Me Yet”). 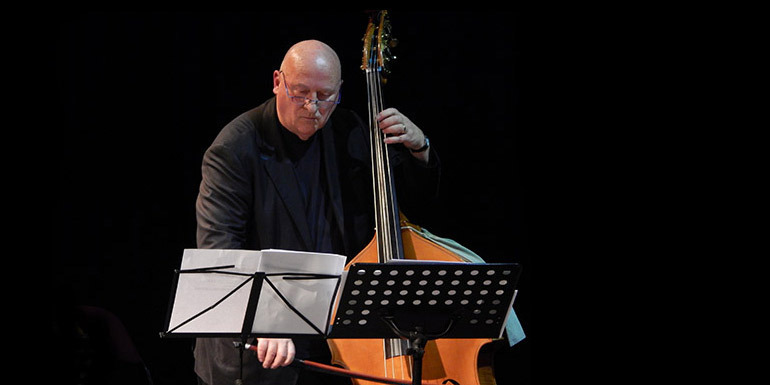 Gavin Bryars started his musical career as a jazz bassist, working in the early sixties with improvisers Derek Bailey and Tony Oxley, forming the famous Joseph Holbrooke Trio. In 1966 Bryars abandoned improvisation, heading instead to the United States to work with the ground-breaking composer John Cage. Bryars’ first major composition, The Sinking of the Titanic, appeared on Brian Eno’s Obscure Records in 1975 and alongside his seminal work Jesus’ Blood Never Failed Me Yet, which featured the looped vocals of a homeless man singing an unknown hymn, established his reputation worldwide as a prominent figure in minimalist and experimental music. Both pieces have evolved and expanded over time, being performed with artists from across the musical spectrum, from Aphex Twin and experimental turntablist Philip Jeck, to the London Philharmonic and Adelaide Symphony Orchestra. The famous 1990 version of Jesus’ Blood, which featured singer Tom Waits, was also nominated for The Mercury Music Prize. Bryar’s list of works is extensive, including numerous operas – Dr Ox’s Experiment for English National Opera, Medea for Opéra de Lyon, The Collected Works of Billy The Kid with Michael Ondaatje and Marilyn Forever with librettist Marilyn Bowering, a chamber opera on the life of Marilyn Monroe – as well as numerous vocal works, concertos and many ballets including the famous Merce Cunning piece Biped, which formed part of the Merce Cunningham Dance Company’s legacy tour and will be revived in 2018 and in 2019 to mark the centenary of Merce’s birth. He regularly collaborates with visual and literary artists, being influenced by his time teaching in Fine Art colleges in the seventies, where collaboration was key. It was during his time at Portsmouth College of Art that he was instrumental in founding the legendary Portsmouth Sinfonia, an orchestra comprised of players using instruments they were completely unfamiliar with. He has worked with visual artists such as Juan Muñoz (A Man In A Room, Gambling), Robert Wilson (Civil Wars, Medea), The Quay Brothers and many writers such as Blake Morrison, Etel Adnan, Marilyn Bowering, Michael Ondaatje and most recently the singer-songwriter Father John Misty on his latest album Pure Comedy.